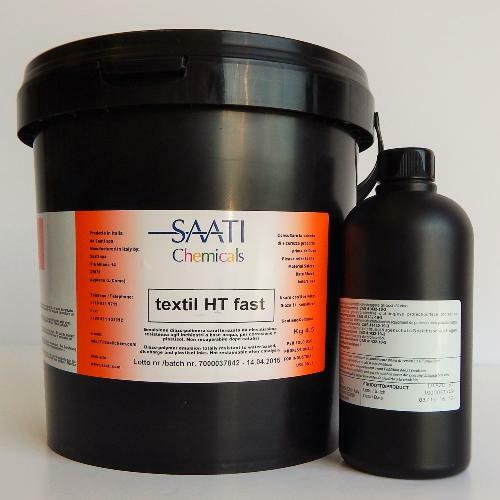 SAATI TEXTIL HT FAST dual cure emulsion is a durable plastisol, discharge and water resistant textile emulsion that is Blue in colour. Used by screen printers of plastisol Inks, water based and discharge inks to print onto garments, jute bags, wallpapers and fine arts. This emulsion reclaims easily, gives a fantastic screen stencil and has excellent print durability. With it high resolution and definition capabilities, this is a great user friendly screen emulsion. Pyramid Screen Products endorse best industry practice that operators should wear appropriate personal protective equipment (PPE) when handling all chemical products, even those classified as 'non-hazardous'. PPE for Saati Products includes gloves and safety glasses/goggles.